India is the home to numerous attractions, amenities, activities and beauties. It is not hard to believe that a land as diverse as India has a long list of travel destinations within its border. Starting from the valleys of Kashmir to the tri-colored sea of Kanyakumari, you will find numerous tourist attractions, which would suit your taste. If you were visiting India in winter, Rajasthan, Delhi, Maharashtra, Tamil Nadu, Kerala, Chandigarh, Karnataka, Goa and other places would be in the top choice. If you choose to visit India in the monsoon, Uttarakhand, Munnar, Kodaikanal, Lahaul, Mussorie, Cherrapunji and Coorg are some of the places to choose. Do not think that the tropical land would become barren during summer season. There are numerous hill stations around the country, which would be at prime beauty throughout the summer season. Apart from high altitude destinations, the beach towns like Goa, Pondicherry, Haridwar and others would also be more popular. India is a land of culture. If you are looking for a cultural tours, you can find a long list for the same. Top cultural spots to visit in India are Jaipur, Varanasi, Agra, Delhi, Kanchipuram, Madurai, Pushkar, Kolkata and others. If you are a strong foodie, choose popular food destinations like Jaipur, Mumbai, Lucknow, Chennai, Chettinad, Cochin and others. The most common element of any vacation is adventure. A vacation is experience gained through unique and beautiful activities. Top places to visit for adventurous time are Jaisalmer, Andaman and Nicobar Island, Lakshadweep, Ladakh, Nagarhole, Mudhumalai, Ranthambore National Park, Manali, Shimla and much more. The combination of popular destinations changes with the style of vacation you want ahead and the time of your visit. No matter how many times you visit the country, India would never cease to impress you. It is not just about the well-travelled iconic destinations. Some of the off-beaten routes are becoming popular among those who want to cut loose from the commercialization. Top off-beaten destinations in India are Majuli, Carkala, Kuutch, Manipur, Arunachal Pradesh, Mechuka, Chopta and others. India is a mixture of everything and everyone. This is the best place to customize your vacation in any unique way possible. Choose from our selection of exciting destinations across India for your next holiday. Rajasthan is India's largest state by area It is located on the north western side of the India. Delhi, the capital state of the country India for 100 years is an exciting tourist attraction. Ladakh is a small city in India which stands as a place for adventure activities. The land of Bollywood is an important tourist destination in the country. Goa is a tiny Indian state, which is located in the Western region of the Indian. The Mughals and Rajputs who ruled Jaipur gave this ancient city, a remarkable makeover. There’s a lot for you. Right from the aquamarine surface of Lake Pichola, Udaipur. Varanasi also known as Benares, Banaras or Kashi is a city on the banks of the Ganges. Have a look at our favourite Asia tour options below. Explore remarkable cultures with an intriguing tour of Asia, travelling from India to Nepal, Bhutan to Tibet including Srilanka. India India being a vast and diverse nation with rich culture and tradition. Nepal Exploration in the land of temples, stupas, monasteries and monuments. Bhutan Bhutan is perfect integration of history, culture and adventure. 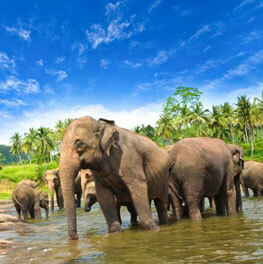 Sri Lanka Sri Lanka is one of the remarkable places to visit.